Where does VR fit into a multitasking world? As someone who has grown up in an incredibly fast paced period of technological advancement, I’m embedded pretty solidly in the middle of the multitasking media generation. I spend most days at a desk with two PC monitors, a laptop and my phone all somewhere to hand. I’ll watch a film on one screen while browsing twitter on my phone. I’ll answer emails while catching up on YouTube videos. I’ll deal with emails on my phone during loading screens in video games. At most times, I’ll have my attention split between a couple of sources of information, and that constant intake of information rarely stops, even when enjoying a piece of immersive fiction. While many will view me as not properly enjoying media, which there is likely some truth in, I’m far from the only person in my age bracket like this. 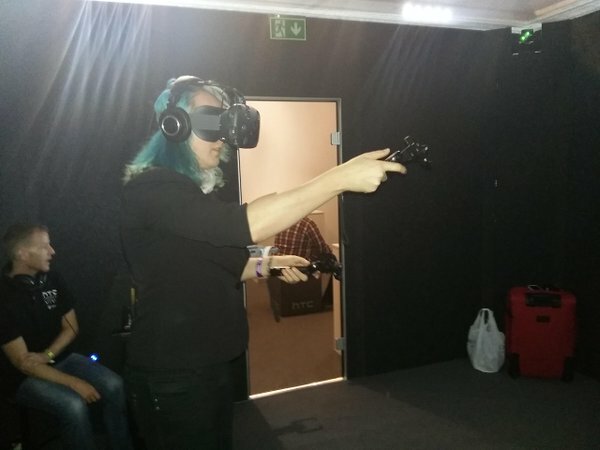 Back in September at EGX I got to try out the HTC Vive, Valve’s Steam VR headset and I was blown away. Placed in an empty room for 45 minutes, I found myself fully enveloped in an incredibly immersive world. For that time, the whole world fell away and my senses were fully focused. My attention was not divided. Over the past few weeks, this experience has been playing on my mind. As impressive as the technology on show was, I wonder how much of my positive reaction to the technology was down to it putting me in a situation where multitasking was truly not an option. I was forced to actually immerse myself non stop in a single piece of entertainment without checking twitter. Every aspect of my always online, always connected life was put aside for a while so I could focus on just one thing. On the other hand, I also wonder if my immersion in VR is a sign that the technology ultimately won’t be a viable part of my daily life. So much of the way my life is structured involves multiple things at once. I’ll watch through a new TV show while editing news articles, or catch up on a podcast while playing a video game for review and checking emails as I go. Will there be a place for long form single product immersion in my gaming life? Ultimately, I don’t really know yet, but I think now is the time for us to start asking how VR is going to fit into the lives of the always multitasking generation? Is VR adoption the answer to a generation who have learnt to live with split attention spans, or is the multitasking generation’s lack of adoption to single focused media consumption going to hamper the adoption of VR as a tech solution? I suspect that only time will tell. TB mentioned an application that surprised me, virtual attendance at live events; in his case, a wrestling event, I believe. And that pointed out that VR doesn’t have to be just gaming, in fact he put forward the idea that it won’t be gaming that drives VR adoption, but live events like sports and concerts. As someone who now finds travel annoying*, the idea of being able to attend Blizzcon on a true VR ticket sounds pretty exciting. Maybe even VR tours of other cities and countries. And since this would be virtual space, but not one requiring constant interaction, there’s no reason for them not to include a Twitter feed, or something similar. * I take 6 different heart meds a day, and since you can’t travel with a week’s worth of prescription medications, I’d have to fill my prescriptions at my destination every time I travel. I believe TB is very correct in that statement. As a matter of fact, one of my friends at university is passionately working with filming the virtual concert experiences with 360 degree footage, and from what I’ve seen, it will be a big thing once VR becomes more mainstream. Additionally, I am myself researching the potential for making films in VR without cinematographic concepts, as these are things that don’t quite work in a persistent environment that you are a part of. In all honesty, gaming is the only aspect of VR I don’t find that interesting, because projecting a 3-dimensional digital world to VR headsets or HMD is already pretty simple and games already afford for the interactive nature of VR, whereas film and concerts/conferences and whatever have you, are not inherently interactive. No, I think 360 degree captured footage (potentially 360 degree live streaming) is the more interesting aspect of VR.